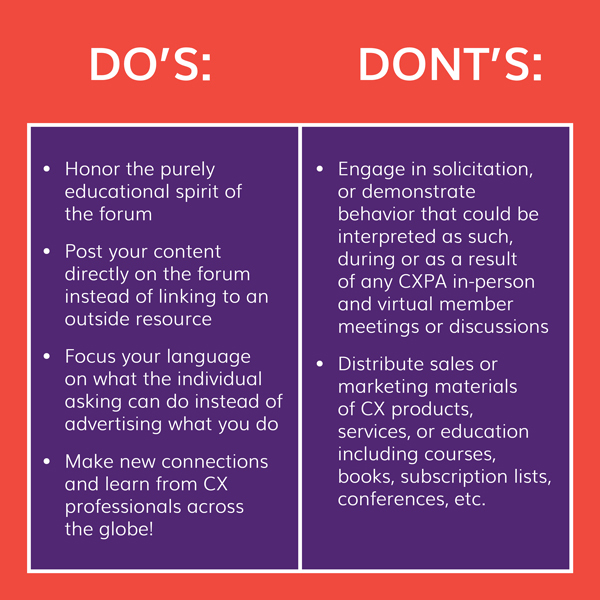 When posting or replying to posts, please adhere to CXPA’s policy regarding self-promotion and non-solicitation. Any content that violates the policy will be removed. If you are looking for a CX service provider, the best place to look is the CX Marketplace as vendors cannot promote themselves in the forum. If you have a more sensitive issue and would like expert input, feel free to pose your critical questions to our CX Expert Panel. If you are not a CXPA member, please visit the Join tab to learn more about our member benefits.